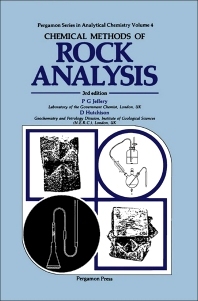 A practical guide to the methods in general use for the complete analysis of silicate rock material and for the determination of all those elements present in major, minor or trace amounts in silicate and other rocks that are routinely, commonly or occasionally determined by methods that are considered to be essentially chemical in character. Such methods include those based upon spectrophotometry, flame emission spectrometry and atomic absorption spectroscopy, as well as gravimetry, titrimetry and the use of ion-selective electrodes. Separation stages are described in full, using precipitation, solvent extraction, distillation, and ion-ex procedures as appropriate. The third edition has been fully revised and updated. @qu:The overall worth of the book remains. It is recommended alike for those preparing or attending introductory courses in geochemical analysis and to those working full time in the field.